Wind energy is widely cited as the fastest-growing source of energy in the world today. For anyone who has witnessed wind turbines sprouting up on the horizon like dandelions over the last ten years or so, this is no surprise. For many others, this development has been less localized to the horizon than to their own backyards, often without community consultation or thoughtful implementation. Wind energy carries with it an abundance of hopes and expectations: that it will power our vehicles, decentralise and diversify our power grids, replace coal-fired power plants, eliminate our reliance on fossil fuels, and essentially save the world from the catastrophic global warming mess that we’ve gotten it into. That’s a lot to ask of a technology that, despite technically exiting on a small scale for centuries, is actually still in its infancy. There was a reason wind power went out of fashion historically while other power generation techniques flourished: it just wasn’t as efficient. Truth be told, despite many advancements and a whole lot of funding for wind energy over the last two decades, it is still inefficient. Wind power is dependent on wind speed, turbine size, and air density. The bigger the wind turbine, the more power it is capable of generating, hence the behemoths we see today (which can range from 200 to 400 feet to the tip of the rotor). The theoretical limit of 60% to a windmill’s efficiency is largely necessary (wind must continue past the wind turbine, after all), but this is still a significant limitation that doesn’t even begin to address the additional problem that these turbines are estimated to not function at all in 25% of cases—as many as 1 in 4 wind turbines, whether they appear to be rotating or not, simply do nothing. Many of the purported benefits of wind energy, such as the lack of harmful emissions associated with conventional power generation techniques, have yet to prove themselves. It is true that wind turbines on their own do not emit carbon dioxide or other greenhouse gases in operation, meaning that on the surface, at least, wind energy has a relatively small carbon footprint. They do, however, rely on the use of rare earth metals, which require mining and are, as the name suggests, of limited supply. This poses a problem for a renewable energy technology to remain ‘renewable’ when it is dependent on a finite resource. The magnets integral to the operation of wind turbines include neodymium, terbium and dysprosium, three rare earth metals that, as yet, have no equivalent substitute. Some harmful emission like CO2 are still released in the manufacture, transportation, and maintenance of wind turbines, but even at its worst, a wind turbine is likely still minimally damaging to the environment. All of this would be understandable, if not laudable, if wind energy were actually efficient and effective as a renewable power source. It certainly has the potential to result in reduced fossil fuel consumption, and less water and air pollution. Whether it will live up to this potential on the scale we need it to, however, remains to be seen. So far, what we have seen is that wind turbines do not last as long as promised, they require far more maintenance than anyone had anticipated, and they don’t produce as much energy as hoped. 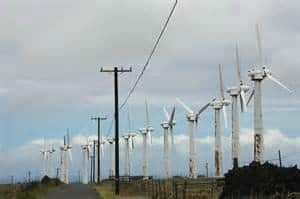 In many cases, the cost of repairs to existing turbines has proven to be more expensive than replacement, as was the case with the 37-turbine Kamaoa Wind Farm in Hawaii. The exorbitant costs involved in developing and maintaining wind farms is increasingly resulting in the abandonment of completed wind farm projects. 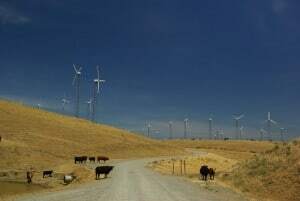 Approximately 4,500 wind turbines have been built and abandoned just in California, while many others are unable to function at maximum capacity due to previously unforeseen problems. 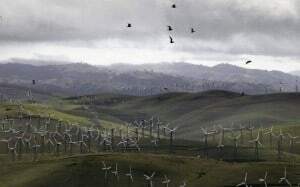 The Altamont Pass Wind Farm of Northern California, for example, was once the largest wind farm on earth, but the turbines must now be shut down during four months of the year to protect migrating birds. Currently, wind power accounts for about 0.2% of the world’s energy demands. Initial estimates posited that wind power could provide the planet with a total of 68 terawatts of power (to put this into perspective, consider that we currently use an estimated 17 TW per year worldwide), but these estimates have since been downgraded to closer to 18 TW, because wind energy isn’t the easy solution we were all hoping for; and could, in fact, have disastrous environmental consequences of its own if employed at the massive industrial scale that would be needed for wind power to provide energy at significant levels. In the US, wind power generated about 3.5% of the country’s electricity in 2012. Since 2007, almost 40% of all the new electricity capacity in the states has been in the form of wind energy, though the actual electricity produced by wind power still accounts for a very small percentage of the country’s power generation. Also as of 2012, wind power provided 2.3% of Canada’s electricity demands, with a goal of 25% by 2025. In Ontario alone, wind energy is expected to generate 10% of Ontario’s electricity by 2030. And as a result of Ontario’s 2009 Green Energy Act (an attempt to meet these lofty goals) a proliferation of haphazard wind turbine projects sprouted up throughout the province. In its early years, it was almost taboo to imply that wind energy was in any way faulted. Saying you didn’t like the idea of wind energy was like saying you didn’t like puppies. However, now that wind energy has reached its awkward teenage years, that unquestioning support has dwindled. Ontario is the perfect example of this renewable energy unrest. The Green Energy Act, with all its good intentions, gave the green energy industry license to install wind, solar and biogas systems wherever they chose, and required the serious implementation of wind energy into the infrastructure of the province—without requiring the permission or input of the municipalities that were to host it…because who doesn’t love wind energy? As it turns out, jumping onboard the wind energy train without due consideration of the potential drawbacks did not go over well with many Ontario communities, resulting in protests, outrage, and declining public standing of renewable energy. This wasn’t just because the turbine dandelions were considered a blight on an otherwise idyllic landscape. Wind farms present real problems, ranging from environmental and health concerns, to community unrest. One of the most commonly cited environmental concerns related to wind energy has to do with avian mortality rates. The American Bird Conservancy estimates that wind turbines kill between 10 and 40 thousand birds per year. This is a huge number of birds, but it is also important to consider this number in context. Estimates in Toronto, for example, suggest that about 10,000 birds die per year between 11:00 p.m. and 5:00 a.m. due to collisions with brightly lit office towers. Similarly, buildings and windows are estimated to kill up to 980 million birds each year in the United States (with another 80 million dying in vehicle-related collisions). Power lines are cited to be responsible for 130 million avian deaths per year in the US, communications towers contribute to another 4-5 million deaths, pesticides to 67 million, and the innocuous house cat to an estimated 100 million. That is not to say that the 10-40 thousand deaths by wind turbines are inconsequential, of course. In some ways it is not a fair comparison—the birds colliding with office towers in Toronto are not necessarily the same birds being killed by rural wind turbines. Ten thousand dead pigeons may not create much of a dent in the overall pigeon population, but 10,000 deaths in a smaller or more fragile avian community could have far more serious and far-reaching impacts. So while it is important to consider wind-turbine-related avian mortality rates in context, and not fall into the trap of overstating the severity of the problem, we still cannot disregard the argument entirely. Birds are not the only causalities; bat populations are taking a hit as well, and while this may not seem like a big problem to city-dwellers who may not have ever seen a bat in their lives, the impact of their deaths has broad consequences, ranging from agricultural losses to significant alterations in the local ecosystem (fewer bats, for example, typically results in more mosquitoes, resulting in the spread of more mosquito-borne diseases—and maybe such a correlation is a touch melodramatic, but it does illustrate the point that anything we do to the environment, even the most well-meaning of alterations, can have vast and detrimental impacts in delicate ecosystems that eventually cycle back to affect us). Estimates suggest that agricultural losses in North America related to current bat mortality rates (due to wind turbines and white-noise syndrome, the two greatest threats bats face today) could cost $3.7 billion per year. The impact of wind turbines on local wildlife has led some facilities (such as those in Searsburg, Vermont) to institute monitoring programs in order to analyse and, theoretically, prevent some of this damage. Others, like Northern California’s Altamont Pass Wind Farm, require that the facilities be out of operation during certain times of the year when avian migration activity is at its peak, preventing avian mortality, but at the expense of much of the facility’s efficiency. On a broader scale, some sources have even gone so far as to point out that there has been “zero scientific empirical proof provided by the wind industry to support their claims of consequential CO2 reduction,” (Droz, 2012) while others suggest that actual CO2 savings from wind energy have been miniscule, if not actively detrimental. The Colorado energy market, for example, in having to accommodate the use of inefficient and unreliable wind energy into its power grid (and continuously balancing the grid on a second-by-second basis with fossil-fuel-generated electricity), found that forcing the inclusion of wind energy actually resulted in having to operate coal-burning power generators at a lower state of efficiency than they would have otherwise, inadvertently resulting in the release of even more harmful emissions. It is also worth noting that wind farming on an industrial scale has the potential to impact global climate by altering the atmosphere’s ability to transport heat and moisture, critically affecting global weather and precipitation patterns by interrupting the natural circulation of moisture by wind. For wind energy to truly provide a reliable alternative to current power generation techniques, it would have to be implemented at a massive industrial scale, at the risk of disastrous environmental consequence. The speculated far-reaching consequences of this impact range from changing hurricane patterns off the coast of Mexico, to having significant downstream effects on cyclones in the North Atlantic. Less dire, but still significant findings include a 2012 study by the journal Nature, which found that large wind farms in west-central Texas have already warmed nighttime temperatures over last nine years by one degree. This is not to say that wind energy does not have the potential to be highly beneficial to the environment, but rather to point out that it is not a cure-all for our environmental problems and should therefore not be treated as such. This is an industry with as much potential for environmental harm as good, and it needs to be regulated accordingly. Noise is the leading complaint from those living near grid-scale wind projects. The impact of this noise is the subject of ongoing scientific and policy debate worldwide. When it comes to wind turbines specifically, noise can be generated by the wind turbine itself while in operation, the facility’s transformer station (when applicable), as well as the vehicle traffic between turbines necessary for maintenance. The two primary types of noise related to wind turbines include mechanical noise (from the motor and gearbox of the turbine’s nacelle), and the aerodynamic noise produced by wind passing over the blades as well as the passage of the blades in front of the turbine tower. Early designs generated a considerable amount of low frequency vibration because blades were placed downwind of the tower, forcing wind to travel past the tower before striking the blades. Modern wind turbine designs have to some extent been able to overcome these noise challenges, but are also considerably larger than many of their predecessors and continue to generate noise complaints from their host communities. A review of the current literature on the subject shows that health effects related to wind turbine noise have been found to include a broad range of symptoms. The largest reported concern is sleep disruption, while other symptoms include headaches, migraines, ear pain, and psychological distress. Wind turbines tend to be found in rural communities where ambient noise is typically low, and may therefore have a more pronounced effect on residents unused to noise. The Canadian Journal of Rural Medicine found that turbines located too close to residents can have a negative effect on their physical, mental, and social well-being, and present a potential cause of health problems. The fact that wind turbines produce noise is indisputable, but what is hotly disputed is whether or not the noise produced is actually capable of causing health problems for those exposed to it. 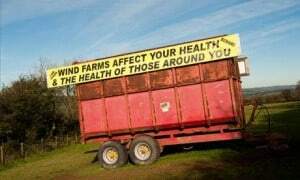 Some wind industry supporters argue that the health concerns reported by individuals living in close proximity to wind farms are merely psychosomatic, resulting from negative media attention around turbines. This argument stems from some intriguing studies that concluded health problems associated with wind turbine noise tended to only be reported after negative media attention began to surround wind turbines, while not occurring prior to this attention in spite of the continuous presence of the wind turbines. While negative media attention around a particular subject does tend to spur complaints, and these complaints may merely be the result of human suggestibility or hypochondria, it is also possible that such media attention encourages increased awareness of a legitimate, existing problem. Historically, people certainly loved their lead-based household and beauty products, but just because increased public awareness of lead poisoning accompanied the presentation of lead-related health problems does not mean that their symptoms were not real, or that lead exposure was not a real concern. The province of Ontario requires wind turbines to be a minimum of 550 metres from nearby residences, but many have argued that this distance is still too close. In Ontario alone, the Ministry of Environment has been cited to have received over 200 health complaints related to wind turbines, and at least one wind company has been the subject of a 1.5 million dollar lawsuit over alleged health impacts. Exposure to wind turbine noise may not be as problematic as coating one’s face in thick layers of lead-based makeup for years, but to disregard the public’s health concerns is at best short-sighted, and at worst dangerously irresponsible. Due to the indirect and insidious nature of noise on health, and the youth of the wind industry, there remains limited scientific research in the area of potential health impacts, a problem which will take time to address comprehensively as longitudinal studies will be required to reach any firm conclusions. Until then, sound level limits (for Ontario, at least) currently fall under provincial jurisdiction. One interesting study, by the Netherlands’ University of Groningen, found that support for wind turbines in the country was sharply divided between those complaining about the noise and those for whom noise was not an issue. What was interesting about this particular study was that the complaints were shown to have very little correlation with proximity to wind turbines. Contrary to expectations, many of the closest residents did not find the noise to be problematic at all. It turns out that many of these unbothered residents were also the ones receiving direct economic benefits from the power produced by the windmills. The opposite was found to be true for those who did complain (some reporting annoyance even at 30 decibels, while many of those in the other group found no reason to be concerned by 45 decibels of wind turbine noise). This finding suggests that involving the local residents in wind energy projects by providing some direct benefit from the presence of wind turbines in their communities could significantly alleviate some of the unrest that has come to be associated with these projects. Anti-wind billboards and driveway signs are increasingly common in many communities, largely due to the resentments bred by the wind industry’s general lack of consultation with host communities. Due to the nature of wind, wind turbines are more suited to particular regions (such as the coast) and require a significant amount of space to operate, meaning that communities in an ideal wind-farm location frequently find themselves the unwilling hosts of large-scale wind energy projects that take over their space. It takes more space for renewables to produce the same amount of energy as fossil-fuel power generation due to lower power density. It has been posited that off-shore wind may be the solution to community concerns and space requirements, though many jurisdictions currently maintain a moratorium on off-shore wind farms. Until things change in this regard and more suitable locations are found for wind farm projects, they remain in the public eye, and the public’s backyard. As a result, the presence of wind turbines (especially the large-scale facilities) has also prompted increased community concern over property devaluation due to the perceived stigma attached to these developments. and concluded that there was no statistically significant impact on sale prices of residential properties in these market areas resulting from proximity to turbines. This study was both peer-reviewed and rigorous, but directly contradicts other studies and local reports that have found the presence of wind turbines can decrease property values by up to 35% compared to surrounding homes. It remains to be seen which side will win this debate, though both sides have certainly claimed victory already. 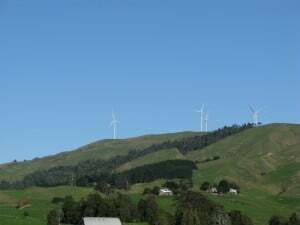 The fact of the matter is that whether or not wind energy is having real detrimental effects on residents of host communities, there is no question that the perceived detrimental effects are influencing the public’s willingness to embrace wind energy and join in the unquestioning devotion of the Green Energy True Believers. Including capital and operating costs, according to the U.S. Energy Information Administration (EIA), wind power currently costs 8.2 cents per kilowatt hour (kWh). This can be compared to advanced clean-coal plants and nuclear power, both of which come in at 11 cents per kWh, and advanced natural gas-burning plants at only 6.3 cents per kWh. Natural gas has the clear economical advantage here already, though this is even more pronounced in light of a recent report which has stated that the EIA’s estimated cost for wind power is significantly understated. 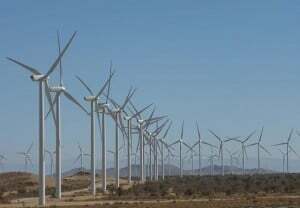 Wind energy in this study is posited to cost almost three times as much as natural gas (15 cents per kWh), and twice as much as the wind industry’s original cost estimates. To put this into perspective, “natural gas would need to cost upwards of $20 per mmBTU before gas-fired power would cost as much as wind” (Helman, 2012). But perhaps this is the necessary price of ‘zero-carbon’ energy? Let’s take a closer look. Compared to nuclear energy (which also emits zero carbon), to match the electricity produced by an $11 billion investment in the construction of two 1,100 MW nuclear reactors over the space of 1,000 acres, we would require more than 1,700 wind turbines and 200,000 acres of space with an upfront investment of $8.8 billion. Nuclear energy may require a larger upfront investment, but it lasts longer and provides reliable power, all the while still boasting the same zero-carbon footprint as wind turbines (even though we’ve found this to be a misleading assertion from the wind industry as it is). If price is no concern in the pursuit of eliminating carbon emissions involved in power generation, wind is still not the most efficient option. However, the fact remains that price is a significant concern when it comes to power generation. So far, wind power has shown itself to be unreliable, inefficient, and prohibitively expensive. Wind turbines, the darlings and monuments of the green energy revolution, have not measured up to practical, real-world requirements. Wind energy may have a political and environmental edge over natural gas and other power generation technologies, but it is not economically viable. In comparison, natural gas is highly economically viable, yet still has a host of drawbacks, including environmental and political concerns that should by no means be disregarded. Though the arguments surrounding renewable energy and fossil fuel energy are extremely polarized and vehement, it may be time to consider adopting a more moderate, balanced approach to the issues. Wind energy isn’t working the way we had envisioned. Does this mean we should disregard the technology entirely, or can this be an opportunity for innovation? Can there be middle-ground between renewable and non-renewable energy? Dismissing natural gas or other established forms of power generation as the enemy of green energy robs us of the chance to improve upon the systems we already have in place to develop a form of power generation that is both economically and environmentally viable. Whether the wind industry succeeds or fails in its current pursuits, is perhaps less a matter of wind technology development as it is the development of hybrid power generation technology that captures the best that both industries have to offer. 2. Bentek Energy (2010). How less became more: wind, power and unintended consequences in the Colorado energy market. Prepared for Independent Petroleum Association of Mountain States. 3. Boyles J., Cryan, P., McCracken, G., Kunz, T. (2011). Economic importance of bats in agriculture. Science, Policy Forum – Conservation, 332, 41-42. 4. Campana, S. (Nov 13 2012). Not in my backyard: on why wind turbines might sound like nails on a spinning metal chalkboard, just not to you. Alternatives Journal – Canada’s Environmental Voice. 5. Campana, S. (Nov 27 2012). Killer turbines? Putting the ‘windmills kill birds’ argument into perspective. Let the ‘stop the house cats’ campaign begin. Alternatives Journal – Canada’s Environmental Voice. 7. Campana, S. (Mar 26 2013). The Nocebo Effect: Are wind turbine health problems real? Alternatives Journal – Canada’s Environmental Voice. 10. Campana, S. (Apr 11 2014). Ontario’s wind problem: accepting the blame. Alternatives Journal – Canada’s Environmental Voice. 11. Droz, J. (Oct 24 2012). Twenty bad things about wind energy, and three reasons why. A Free-Market Energy Blog. 12. EPA New England (2014). Energy and global climate change in New England. Wind Energy. Boston, MA. 14. Gunderson, B. (Mar 16 2013). Some basic facts about wind energy: it doesn’t work. Washington Times. 15. Health Canada (2012). Health impacts and exposure to sound from wind turbines: updated research design and sound exposure assessment. Health Canada Environmental and Workplace Health. 16. Helman, C. (Dec 21 2012). Why it’s the end of the line for wind power. Forbes, Energy. 17. Martin, C. (Aug 16 2013). Wind turbines: as number of wind turbines grows in Ontario, so does list of rural municipalities opposed to the highrise-sized towers on their turf. The London Free Press. 18. Miner, J. (Oct 4 2012). Wind turbines: a provocative new study finds property values plunge after wind towers arrive. The London Free Press. 19. Miner, J. (Apr 29 2014). Wind turbines have little effect on property values, study finds. The London Free Press. 20. Morden, P. (Jan 16 2014). Review of scientific literature found adverse health effects. The London Free Press. 22. Paramaguru, K. (Dec 20 2014). Rethinking our risky reliance on rare earth metals. Time, Technology. 23. Turkel, T. (May 1 2011). 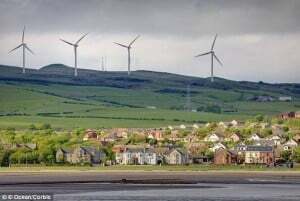 Wind turbine noise an issue, report finds. Portland Press Herald. 24. Williams, M. (2014). Positive and negative facts about wind energy. SFGate Home Guides.